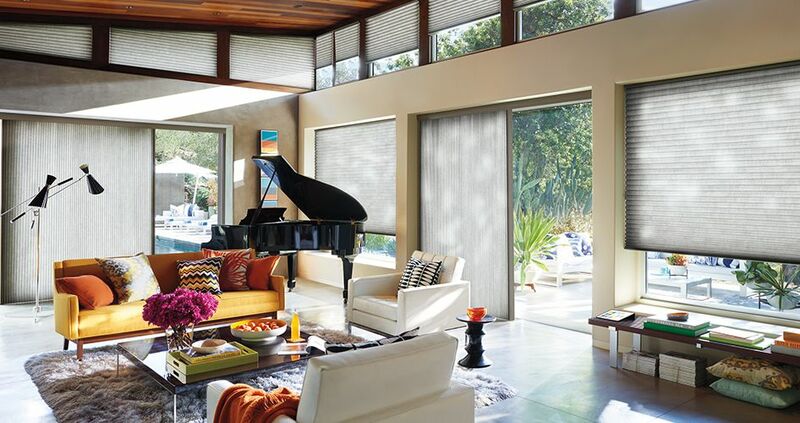 While virtually any Hunter Douglas window treatment can be outfitted for a traditional patio or sliding-glass door, certain styles are better suited to these and other large expanses of windows simply because they traverse horizontally, making them easier to operate on these applications. 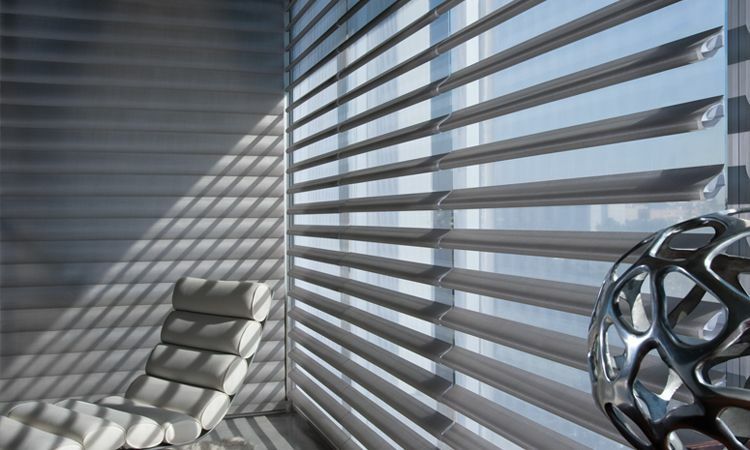 Beyond traditional vertical blinds, we have many innovative alternatives to choose from. 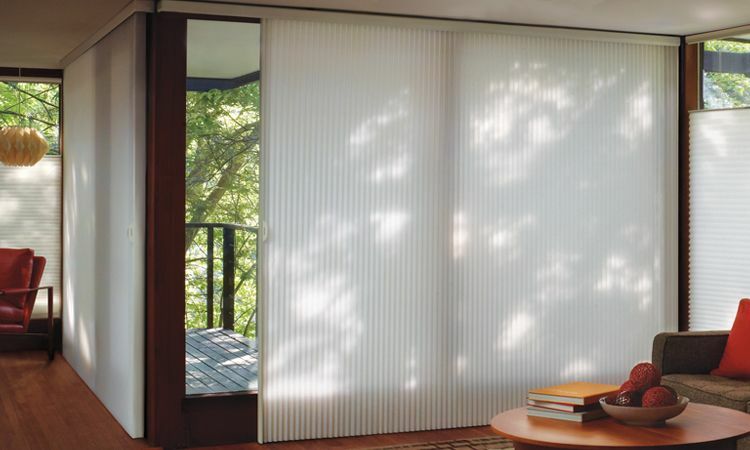 For doors that need extra insulation from the heat or cold, a cellular honeycomb shade with the Vertiglide™ operating system is the ideal option. This system is very simple, with no cords, chains or wands, and gives you flexibility to use one shade to cover the entire expanse or split it into two with each shade operating independently. If you are looking for a classical, elegant look, vertical sheers are a good choice. 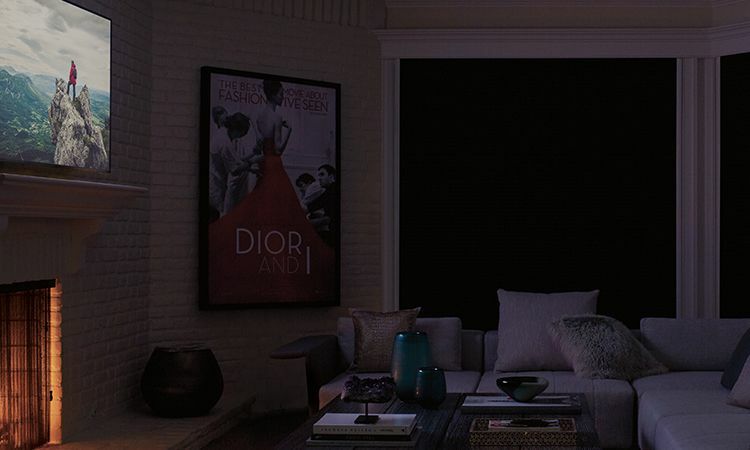 The sheer facing resembles traditional sheer draperies, while the 180-degree rotating vertical fabric vanes give you complete control over light and privacy to create the perfect ambiance. For a sleek, modern look, consider our gliding window panels. These are the perfect solution for large, expansive doors and windows. Our patented design allows an infinite number of panels to attach to one slim headrail regardless of door and window width making the stackback minimal. 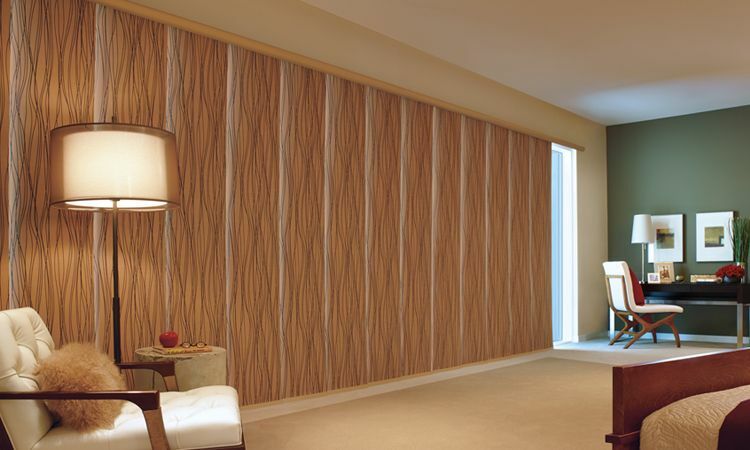 The perfect casual look can be found with the vertical-style option of our Provenance® Woven Wood Shades that are made with a combination of natural materials such as bamboo, woods, reeds and grasses. 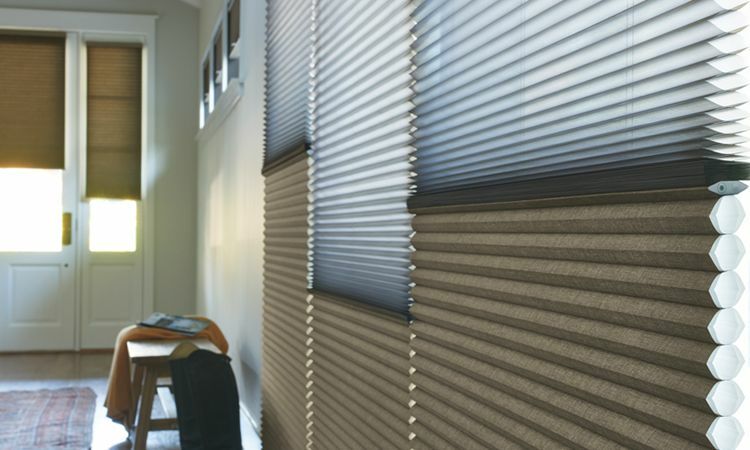 Alustra® Woven Textures® are available as Skyline® Gliding Window Panels for vertical applications, and in Roman and roller shades for horizontal applications offering a complete look for your room. Woven Textures fabrics are a unique combination of fibers and textures and are a perfect alternative to solar screens and woven woods. 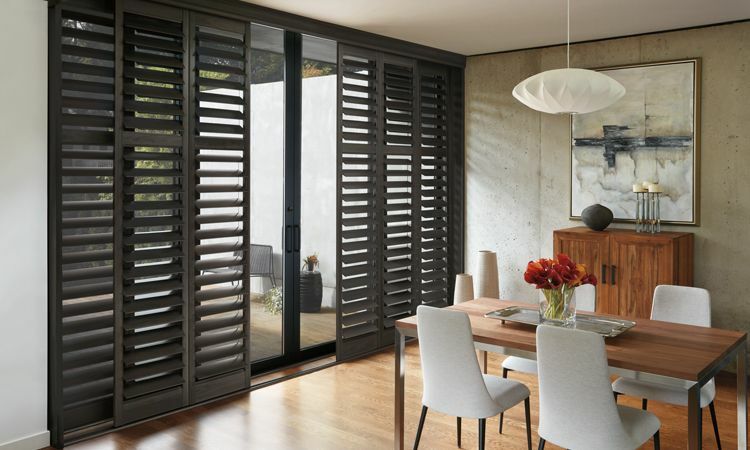 Hunter Douglas offers three shutter collections that all can be made with the bi-fold and bypass track systems that are unique choices for patio and sliding-glass doors. 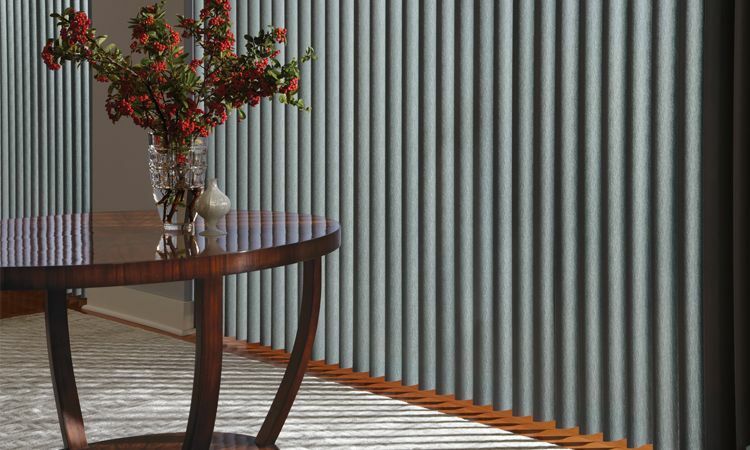 Hunter Douglas window treatments are designed to require minimal care and cleaning that may include regular dusting and periodic vacuuming. Dusting. Regular, light dusting maintains a like-new appearance of most blinds, shades, sheers, shutters and window panels. CAUTION: Do not use magnetic cleaners such as a dusting mitt on light-dimming fabrics. This will damage the light-dimming backing. Vacuuming. Vacuum gently using the brush attachment on any vacuum cleaner. Most products may be vacuumed using a vertical stroke. EXCEPTIONS: Do not use a brush attachment or long vertical strokes to vacuum Luminette®Privacy Sheers as these actions will crease the fabric. Also, do not vacuum Architella® Elan® and Architella Elan Eclipse® fabrics. Blowing. Use a can of compressed air or a hair dryer (non-heat setting) to dust off selected window coverings. Care and cleaning guidelines are also found on each respective product page within the Manuals tab. Note these guidelines are applicable to products purchased in the U.S. only. Instructions on how to remove your Hunter Douglas product from the window frame are found on each respective product page within the Manuals tab in the Operation Manual. Click here for a complete list of operation manuals listed by product. Not all Hunter Douglas window treatments can be spot cleaned. Due to the nature of spot cleaning, download our Care & Cleaning brochure to determine if this process is safe for your product. If spot cleaning is an option for your product, we recommend using a mild detergent (no additives and non-abrasive) and a clean, white cloth. The spot cleaning process is described for each individual product on its respective product page within the Manuals tab in the Operation Manual. Hunter Douglas acknowledges these cleaning methods as being safe and effective for specific Hunter Douglas products purchased in the U.S. only. Reference the Operation Manual within the Manuals tab for individual product cleaning information. Injection/extraction cleaning. This type of cleaning injects a cleaning solution into the fabric and extracts the dirty solution in the same motion. It is a very effective way to deep clean your window treatments. 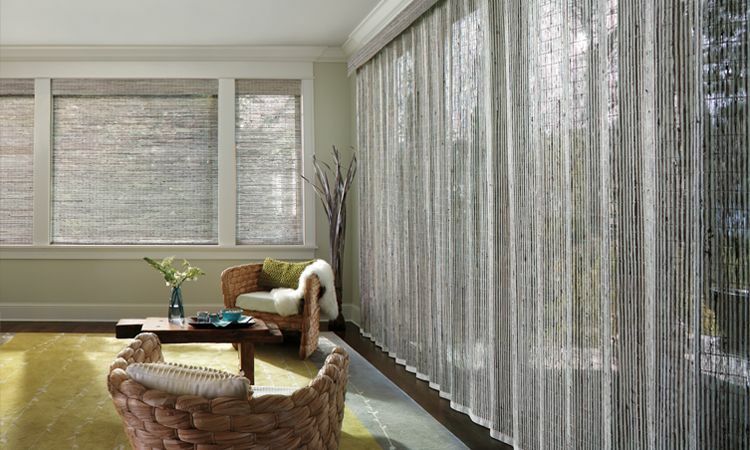 The service is typically performed in the home so there is no need to remove your window treatments. NOTE: Do not use this method to clean fabric-covered head rails or fabric-covered valances. A dry method is recommended for these along with certain fabrics. Ultrasonic cleaning. Professional ultrasonic cleaning is recommended for several products. This method involves immersing the product in a tank of cleaning solution. 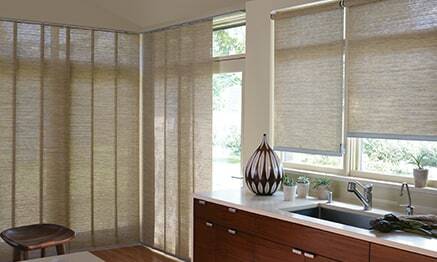 Hunter Douglas acknowledges most cleaning methods as being safe and effective. We cannot, however, attest to the quality of equipment or services provided by any independent cleaning facility. To locate businesses that utilize recommended professional cleaning methods, check the online yellow pages for local services in your area. Or contact one of our professional Customer Information Product Specialists at (800) 789-0331 for more information. To prevent damage to delicate fabrics, resist the urge to use any type of stick, wand or handle to push out pests that are caught in your window shades. We recommend gently blowing them out using a can of compressed air or a hair dryer on a cool setting. In December 2004, Cyndi Roberts founded Blinded by Delight Window Coverings & Design as a shop at home service. Due to the tremendous response and growing clientele, we officially opened our Hunter Douglas gallery in 2013.The primary goal at Blinded by Delight is to educate our clients on the various options. There are many products and vendors with all different price points. The finished product is our client’s choice based on what is most important to them: be it price point, versatility, or uniqueness for their home.Whether you are looking to spruce up your living space, update your home decor with contemporary window treatments or simply modernize your blinds and shades we have excellent specialists that will assist you in finding the best selection for the vision you have in mind for your custom window coverings.Schedule an appointment today. It’s free, there’s no obligation. Come to our gallery to see all the options on display. Our Hunter Douglas Showroom is one of the best in the region! We ask that you bring your basic measurements of the custom window coverings you are interested in installing, as well as photographs when possible. Once you are ready, we will schedule an in-home appointment where we will take detailed measurements in order to finalize your project. Simply click on Schedule An Appointment or call 210-336-5266. Our hours are Monday through Friday, 9:00am to 5:00pm, and Saturday, 10:00am to 4:00pm. At Hunter Douglas, we’re an industry leader in making a big energy savings difference at the window. 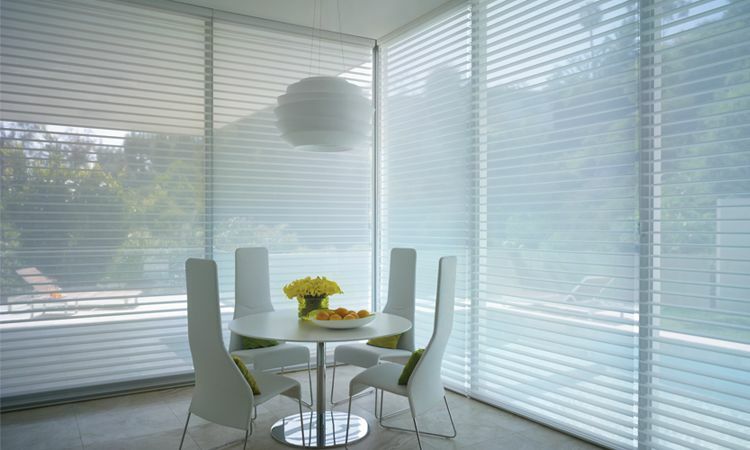 In 1985, we invented the highly energy-efficient Duette® honeycomb shades in response to the energy crisis of the late 1970s. Our latest innovation is the Duette Architella® honeycomb fabric featuring a honeycomb-within-a-honeycomb design for even greater energy efficiency. 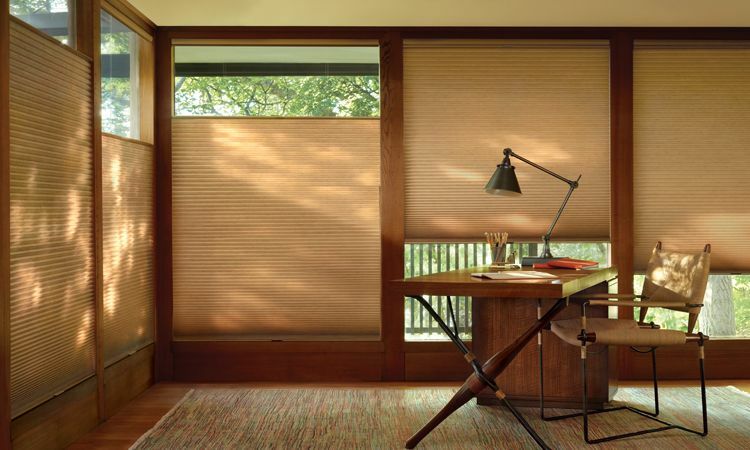 Today, we continue to think about the impact all of our window fashions can make. Without energy-efficient window treatments, as much as 50% of a home’s heating and cooling energy can be lost through its windows. Schedule an appointment today. It’s free, there’s no obligation. Come to our gallery to see all the options on display. Our Hunter Douglas Showroom is one of the best in the region! We ask that you bring your basic measurements of the custom window coverings you are interested in installing, as well as photographs when possible. Once you are ready, we will schedule an in-home appointment where we will take detailed measurements in order to finalize your project. Simply click on Schedule An Appointment or call 210-336-5266. We are located at 140 Heimer Rd. Ste. 685, San Antonio, Texas 78232. Our hours are Monday through Friday, 9:00am to 5:00pm, and Saturday, 10:00am to 4:00pm.